Litigation is a very popular method to resolve a business dispute or controversy between individuals, and between Illinois business organizations. The litigation process begins by the filing of a lawsuit or “complaint” before the court of law with proper jurisdiction to hear the case. In a nutshell, the commercial litigation process begins with the filing of a complaint that must be properly served on the defendant or defendants. Then comes discovery and/or motion practice. Discovery can be the longest stage of litigation, and involves the parties exchange of information relating to the dispute (documents, testimony, etc.). Motion practice involves a number of different types of motions, including motions to dismiss, motions for summary judgment and motions to compel, among others. Once the parties have concluded discovery and motion practice, the case will be set for trial, whether it is a jury trial or a bench trial (no jury). 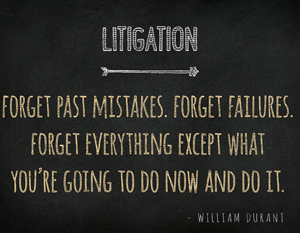 We understand that litigation can be heated, emotional, costly and stressful. We are dedicated and prepared to provide our clients with the most effective legal representation possible. We strive achieve the best possible results for our clients. To learn more about our litigation practice, please contact our Chicago law office.